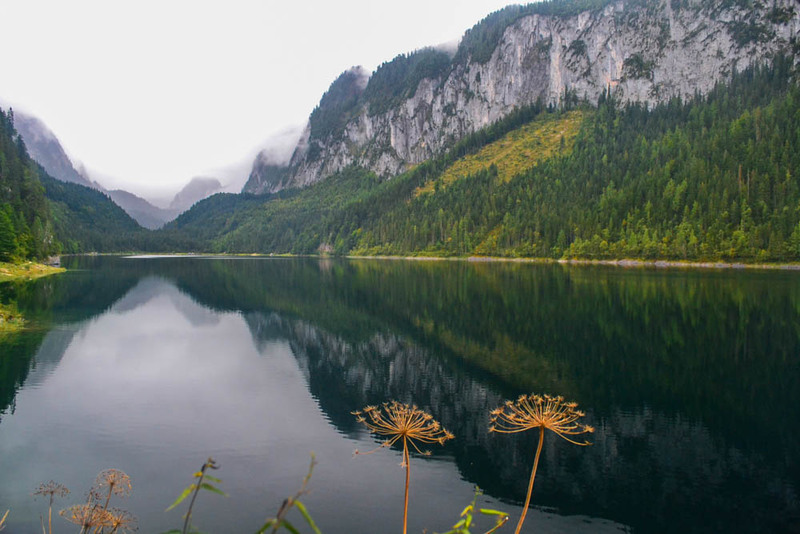 Gosausee is one among numerous lakes dotting the Salzkammergut landscape in Austria and arguably, one of the prettiest. 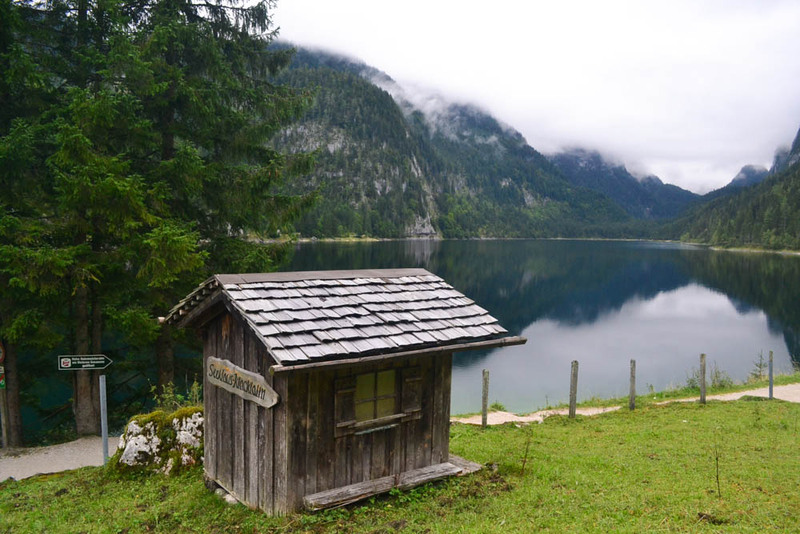 Fed by melt water from the Dachstein glacier, these are actually 3 lakes, the most famous of which is the Front Gosausee. On a clear sunny day, if the waters of the lake are placid and calm, it reflects the Dachstein glacier on the massif above. This is a photo op that has been captured for posterity a lot of times, but tourists can seldom imagine the colors reflected in the Gosausee. And coming from somebody who has been to extremely pretty Himalayan lakes as well, this shade of green, surrounded by alpine forests, seems to be the outcome of a different brush stroke. 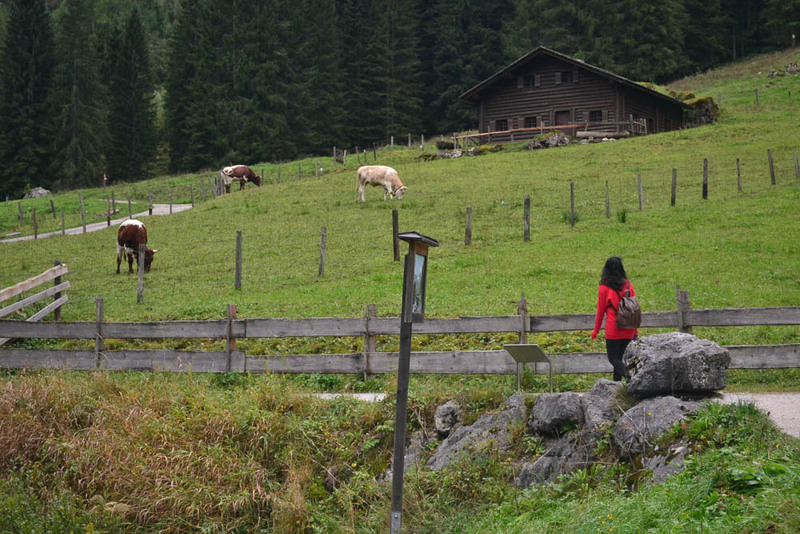 The ride to Gosausee passes through forests and through the wide open Alpine vistas of Gosau village. Self drive is one way of doing it. But if you are using public transport, there is an easy way of doing it. From Salzburg, catch bus 150 till Bad Ischl. 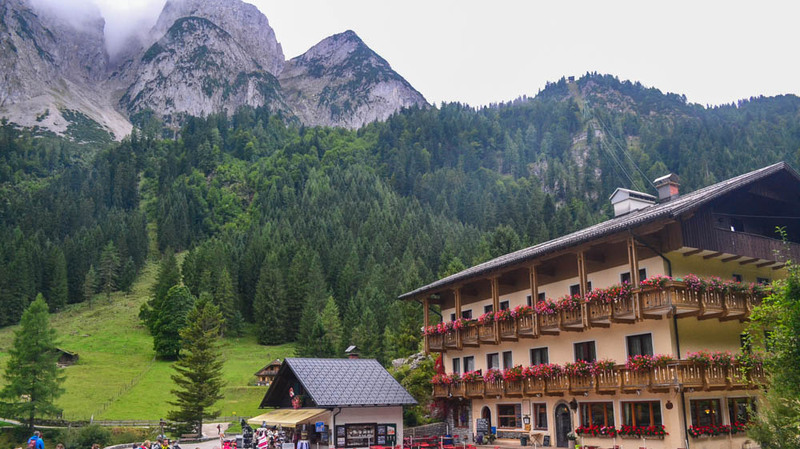 From Bad Ischl, catch Bus 542 that will drop you right to the lake head of Gosausee in about 30 minutes. 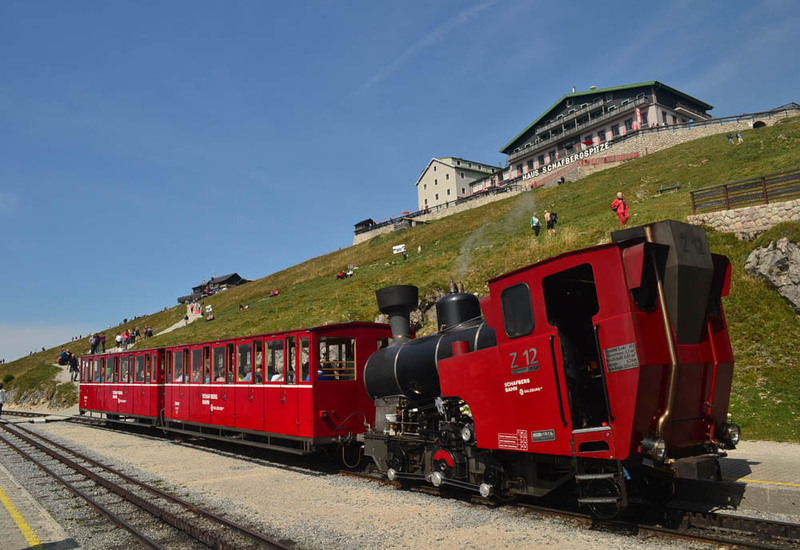 If on the other hand, you are arriving from Hallstatt, catch Bus 543 till Hallstatt Gosaumuhle. From there, catch Bus 542 to Gosausee. Do the reverse if you plan to visit Hallstatt from Gosausee. From Hallstatt Gosaumuhle, bus 543 takes us through winding narrow roads surrounded by hills and forests. There is even a mini traffic jam created due to a fallen tree branch. A few minutes later, the forests open up into a valley that is the village of Gosau, even prettier than what we have witnessed in St Gilgen and St Wolfgang so far. Imagine wide open pastures, merry brooks, grazing cows, sheep and ponies and pretty houses with smoke billowing out of their chimneys. We almost have our noses stuck to the tall glass windows of the bus in amazement at the beautiful scenery. And we realize all the other tourists are doing the same. Close to half an hour since we board the bus, we reach Gosausee and being the last stop on the line, the bus empties. Parking is free here, for those taking the effort to drive. We have caught a glimpse of the gondola on the way and the Gosausee bus stop sits right beside the ticket booth to the gondola cars. Since we don’t have much time, we choose to skip but reckon that it must definitely be worth the effort and the price at around 19.50 euros each. At the entrance to the lakehead, the Gosausee Inn and it’s pretty flowerbox windows provide a picturesque retreat. It is also one of the most obvious stay options in the lake’s vicinity. 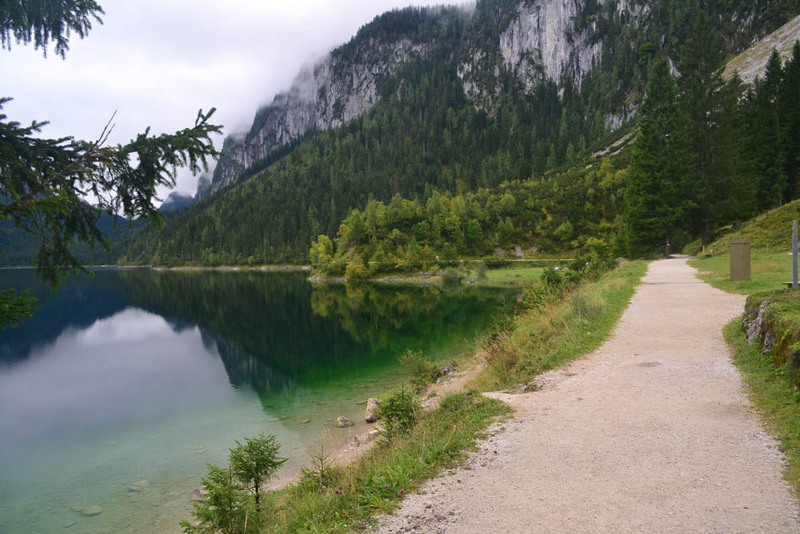 We catch the first sight of Gosausee and it is stunningly green, without a doubt, the result of crystal clear waters reflecting the greenery of the forests and the hills that have created this little nestling valley and the lake. Boats for hire, not bobbing at all but lying still, at the entrance to the Gosausee lake head. In the distance, the Dachstein glacier is obscured by clouds and we imagine what a sight it must be on a bright sunny day. We catch multiple hikers around the lake trail, but mostly, it is isolated and tranquil. We are not oblivious to the varying shades of emerald and green that the lake presents. There is also a warning sign that cautions hikers to watch out for boulders falling from the hill above. The trail is a gentle 9 km walk that will probably take us 3 hours. The woods are really, as Frost put it, lovely, dark and deep. At some places, the trail poses an incline that looks down into the lake at a steep precipice. At a few other spots, the lake is just a few steps down the trail. But who in their right mind would want to disturb the placid waters of the lake ? 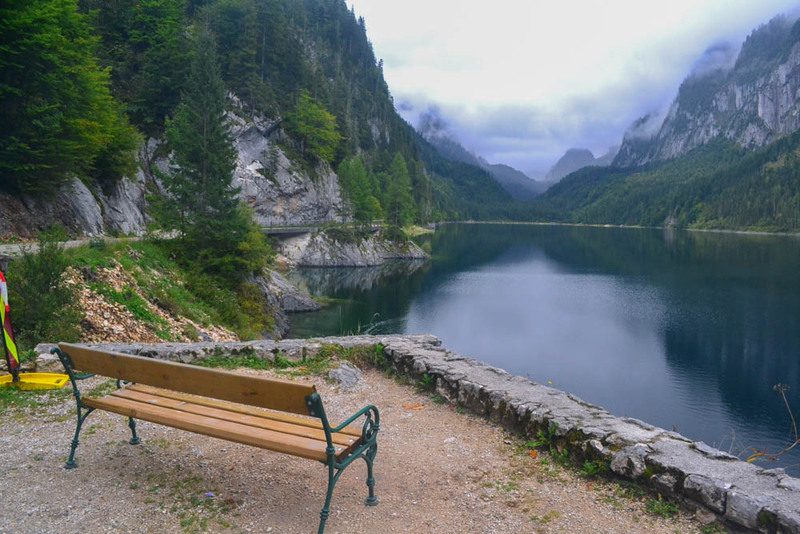 Benches dot the stretch of the Gosausee trail and it is really soothing to spend a moment lost in silence, watching the colors of the gentle lake and those of the hills that watch over it with love, from the front seats. A privilege if you ask me. Pretty soon, it is time for the bus back to St Gilgen and with a heavy heart, we turn our backs to one of the most beautiful places that we’ve witnessed on this charming little blue dot that we call home. Yes, without a doubt, we recur, every time we look at these photos. 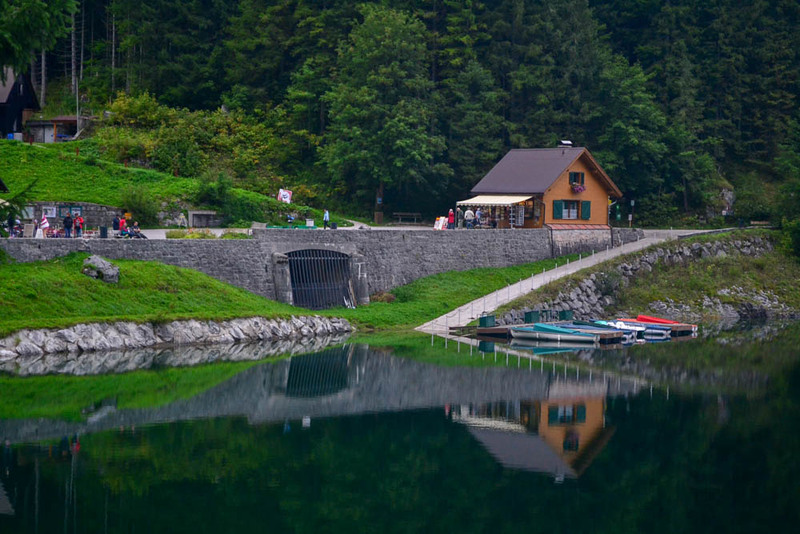 Gosau and it’s lake Gosausee make for an easy day trip if you are in the vicinity of Salzburg. 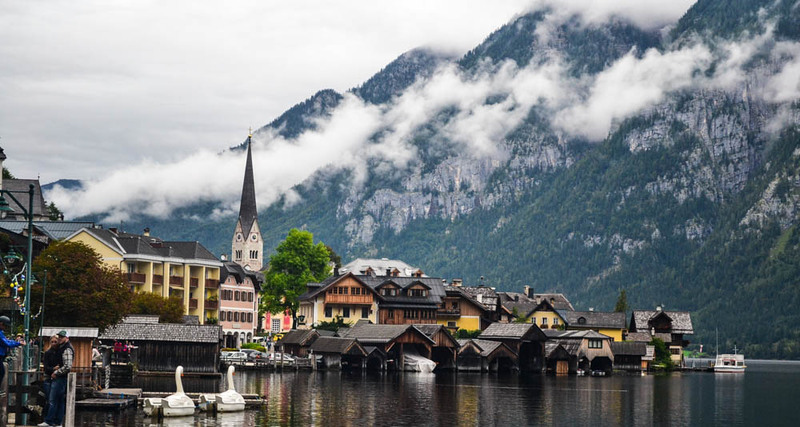 St Gilgen, Bad Ischl and Hallstatt are closer to the lake than Salzburg. 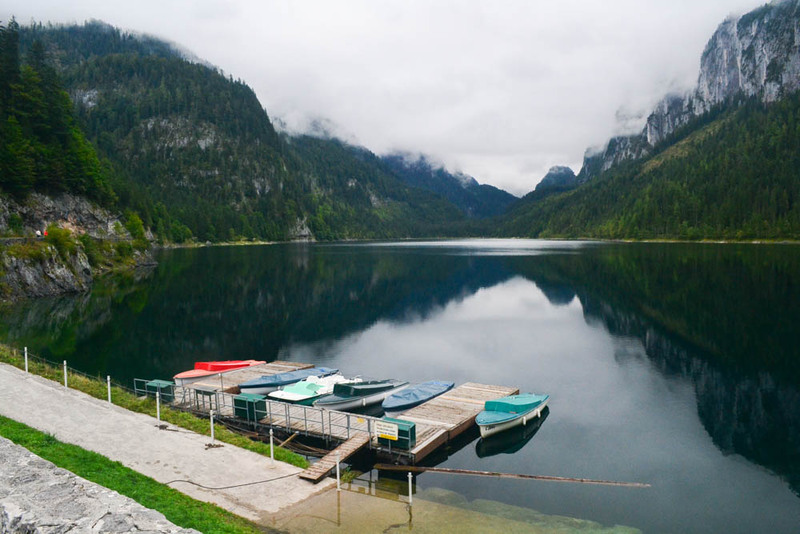 You can also combine Hallstatt and Gosausee if you are making a day trip, these are not really that far apart. The only hitch is the bus timings that you can check up on excellent Salzburg Verkehr app before you plan your trip.